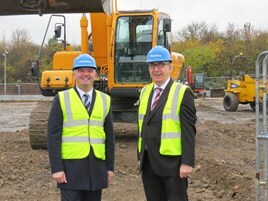 Motorline Group has seen work get underway on its new £8.5 million showroom and service facility for its Nissan and Skoda franchises in Dartford. Set to open in 2017, the 12-car Nissan and 10-car Skoda showrooms will replace the Princes Road facility and are being built on a 2.5 acre site at The Bridge, a 264-acre mixed-use development adjacent to the Dartford Crossing. In a joint statement, Paul Stapylton and Tony Jones, operations directors at Motorline for their respective brands, said: “This is an exciting time for both brands as they will be represented in some of the best facilities available in the industry. Glen Obee, Motorline Group chairman, added: “We are delighted that work has started on these dealerships at what will be a landmark development in the Thames Gateway.